Preaching is not about performance, nor ritual. It is a communication event. Like most things, how you understand it flows out of how you view God. If you see God as a distant power broker, a singularity focused exclusively on his own self-absorption, that will influence the way you preach. I suspect you’ll be torn between making much of Him because you should, and making much of self because that is the logical conclusion of being made in His image. The Bible will function as a code of instruction to decipher and disseminate that others might know how to satisfy the distant One. But if you see God as the eternal fellowship of the trinity who is always others-centred, so that His love has reached out to us to bring us into fellowship with Him by His grace, then that will also influence the way you preach. And it seems to me that preaching will consequently be a much more relationally-charged event. 1. God. Without whom preaching is an exercise in human performance. I wonder whether we might sometimes tip our hat to the importance of God’s role in our preaching, but then pray and preach as if our dependence is only token? Truly, apart from me, you can do nothing. Surely preaching without God’s involvement is an exercise in abject futility? But what does it mean for God to be involved? Just that we pray to Him? If we pray to Him and then preach about Him, is that enough? What if Christianity is much more participatively relational than we have realized? 2. Listener. Without whom preaching makes no sense, since it is not about us or our desire to impress God with our rituals and performance. Again, I wonder if our preaching is genuinely marked by an awareness of those to whom we preach? More than that, do we really consider the connection between us and those to whom we preach? It is easy to tip our hat to the importance of knowing the listener, but then preach as if they are a generic gathering of folks. But the listeners matter precisely because of the kind of God that we have. He knows, He loves, He cares. Consequently He expects those preaching His Word to also know, love and care. 3. Preacher. Without whom the conversation would be about something other than preaching, but really, does the preacher matter? I say yes. There is a vital role for the preacher precisely because of the kind of God that we have. He is a communicator, He cares, He incarnates. Consequently He values the human speaker, who also should care, who in some way is an enfleshed presentation of the Word. 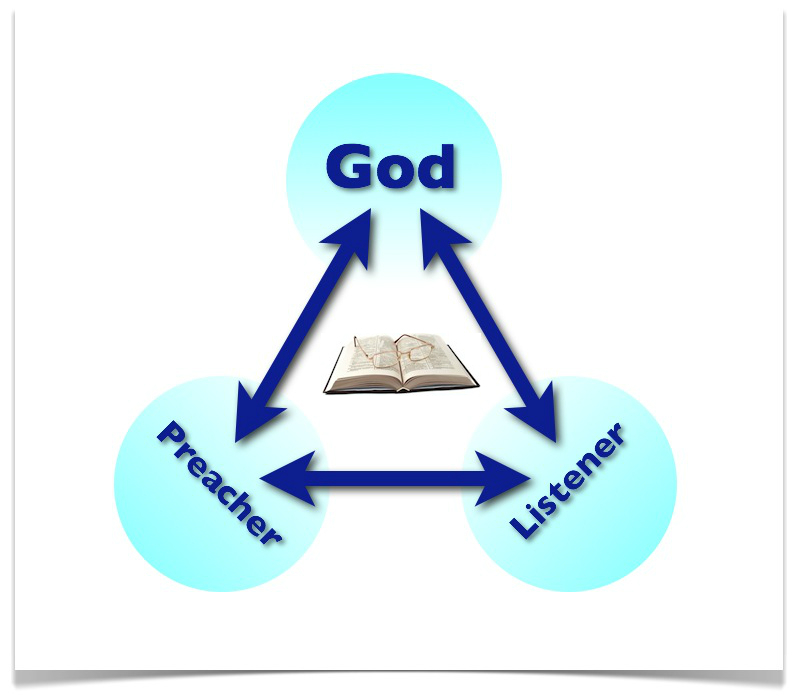 All three participants matter greatly in the preaching triangle. Tomorrow I’d like to drill down a bit more on why each one matters, before we then start to probe the relationships in this triangle.